Does your Raleigh residential roof have to be mended or repaired? Is Your Roof Leaking ? Has your house suffered from storm damage, Hail Damage near Raleigh NC ? Does your home or business require a new roof, gutters, siding, or chimney? AMI Builders NC provides those home improvement services. We offer a Free NC Roof Inspection and Quote — Serving the Raleigh and surrounding regions, AMI Builders NC provides residential houses with efficient and advanced full Home Solutions. Whether you need a roof, siding, gutters, windows or a chimney, AMI Builders NC provides high quality materials, specialist knowledge, and committed workmanship that North Carolinians have learned to trust. Many ‘so called Roofers; and Roofing Contractors swarm to regions pummeled from hailstones like bees to honey directly if a violent storm occurs. A range of these companies maybe fine, however many are extremely hazardous. Lots of Roofing Contractors have only the notion of a fast buck on their thoughts. Several are mentioned as Storm Chasers. They swoop in, take people’s money and are all gone. Never to be seen again. The very last thing in their head is what is best for you the homeowner. By the time anybody, the City/County Building Departments and District Attorneys know what went on, the injury is completed and you the homeowner will be abandoned with the difficulties out and out scams to badly install roofs. Problems with roof accessories, materials, and setups differ from minor to significant flaws, mistakes, or omissions that won’t appear at the same time, but can, possibly months or even years afterwards. All general contractors, providers, manufacturers and contractors or contractors create errors. It does not matter yet giant or little, or however long they may have been around, or exactly what their title is — most of them make mistakes and ofttimes it may take years to observe that the damages. In the wake of hailstorms, Roofing Contractors tend to make much further mistakes. They frequently use new crews to take care of the extra work, the Storm Chasers, several whom will not install roofing even close to acceptable roofing criteria. Our specialists are trained to finish your roofing repairs conveniently and quickly, at an inexpensive price. Speak to our staff at AMI BUILDERS NC Before you buy… Call AMI… Neighborhood Roofers You Can Trust 919-812-7282. City/County Building Inspectors become too busy to perform their conventional roof inspections due to the massive selection of roof inspections from such violent storms. Many City/County Building residential and commercial Inspectors do not have the time, nor the experience generally, required to correctly carry out a roof inspection / review. Employ a seasoned Roofing Inspection/Consulting Company, such as AMI Builders NC. We’re a Licensed GAF Roofer. Redemption Roofing: A GAF Certified Roofer; Beware of any contractor you are working with. Even Neighborhood Roofing Contractors inside the wake of a storm, may not be that they claim to be. Some Storm Chasers are happy to return to a city or city and understand the names of those reputable local roofing firms. Some acquisition or enroll a similar locality Roofing Contractor’s name or business. Stop! Do not replace your roof instantly. Owners are horribly vulnerable during this stage, feeling that the pressure to get their roofs replaced at the same time, by their own Insurance companies and the numerous Roofing Contractors which come knocking at their door. Do not allow the stress to get to you. In most cases blasting stones solely hurt the roof stuff inflicting the roof life to diminish greatly. Just a couple of hail stones cause escapes. A possessor has the time to sit back and allow the dread and craziness which hailstorms bring detract. Indeed, it is inside the Real Estate owners’ best interest to attempt to do so. The Roofing Contractors and their Roofers, Providers, and Manufacturers are stretched at this time, normally on the other hand their limitations. Roofing Installations and normally the Roofing Materials are usually not anywhere near as great as they are 3 to 6 weeks or down the street. In the event the storm damages that an over-sized assortment of roofs at a locality, it might even be greater to wait for six weeks to a year prior to terminology up with any Roofing Contractor. The Insurance Company’s most important aim is to induce the promises from the own hair as speedily as possible. So that they can motivate Property home proprietors to induce the roofing replaced as soon as possible. However, don’t permit them to intimidate you. Typically, your own non-depository financial institution enables you annually to change your roof. Check your coverage. It’s true, you want to reevaluate your losses simultaneously however that does not mean commutation the roofing simultaneously unless there are a few, many holes through the roof that can cause additional damage anytime it rains. Most roofs which are leaky will be temporarily repaired or lined. Again, just a few roofs must have replaced simultaneously. Roofing Contractors can also try everything to induce one to register together. They will assure you the planet, inform you that the roofing goes to drop in on you, say they will be there resulting day or night, or in case you don’t check in together now you might not receive their distinctive hail sale value, etc., etc. Beware of Roofing Contractor agents’ agencies caked Inspectors, Hail harm Experts, Hail Repair Specialist, Insurance Inspectors, maintain Experts, maintain Advocates, Hail advisers, Storm consultants, etc. Many are Roofing Salesmen interested exclusively in getting available. Also, look out for businesses and agencies that say they will take care of your claim and do the roofing for no matter their non-depository financial institution pays the companies. Most are only “Storm Chasers” whether they are native Roofing Contractors or out of town. There’s not any way to highlight the value of obtaining an expert Raleigh roofing inspection review enough. Far too frequently when the need arises to get a circumstance in which a review should take place individuals either look at the rooftop themselves or bypass it entirely. If you’re not a trained and expert Raleigh Roofer, such as AMI Builders, this isn’t the sort of job you need to take on as a DIY job. Your roof is a significant investment. Additionally, it appears to be the most crucial quality part of your homes dwelling. So why don’t you treat it with all the concern and care it deserves. And there are lots of cases when a roof inspection is needed or should occur. Speak to our staff at AMI BUILDERS NC Before you buy… Call AMI… Neighborhood Roofers You Can Trust 919-812-7282. Let Us Come out and Give You a Free Hail Damage Roof Inspection. Roof Inspection Raleigh There are loads of other reasons to acquire a professional roof inspection in Raleigh, NC. Among the most frequent service calls we receive is to get inspections after any harsh weather events. Many folks assume that there’s damage from hail by searching for holes. But hail often does enough structural damage without resulting in any holes. Following a storm, you get a limited period to file and insurance claim. Therefore, if you assume nothing is wrong then find out six months after there’s storm related harm, you aren’t going to have the ability to submit a claim. Raleigh Roofing Inspections Another reason to think about obtaining a Oklahoma City roofing review would be to follow up following a different contractor has completed work in your own rooftop. There’s not anything wrong with getting another opinion and making certain the job was finished in the right way. Without this kind of review, you might have only paid for a new roof that will give you nothing but trouble from day one. Roof Repair in Raleigh NC the excellent news is that, if after a checkup, we detect some issues we could manage those. At AMI Builders we’re as well-known for our Raleigh roof fixes as we’ are the NC roof inspections. If it comes to caring for the rooftop nobody manages the job like our staff. Contact us now to establish your roof inspection or other associated providers near Raleigh. Handling insurance claims for roof may look a complicated enough endeavor to just not need to get it done. There are many things that undermine this component of your residence and it’s very important to look after issues whenever possible. The largest potential dangers are storm related harm. As a homeowner you want to learn about how to care for your roof to attempt and stop harm. But in addition, it entails understanding what to do if harm occurs. Therefore, even if the roof appears to be fine to your eye, allow one of our Roofing Contractors care of offering an expert investigation. Roof Damage Insurance Claims Among the most typical causes of storm associated insurance claims for roof is hail damage. The dilemma is that many homeowners have a look, do not find any leaks and believe everything is nice. But big hail stones which hit on the roof cause harm that does not always mean that you will have escapes as signs of harm. If it comes to insurance claims that you need to also have policy which includes other facets of your rooftop including siding, gutters, windows and other characteristics. When the roof is damaged and rain water gets to your house resulting in damage to walls, carpeting, furniture or other attributes then it should be covered also. Allow the knowledgeable experts here in Storm Shield Roofing help you get through the procedure. 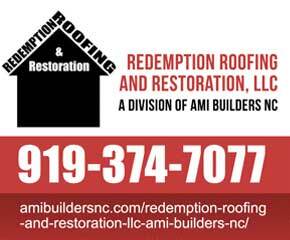 Redemption Roofing and Restoration, LLC – AMI BUILDERS NC PROVIDES ROOFING SERVICES IN RALEIGH, APEX, CARY, GARNER & SURROUNDING AREAS Specializing in roofs, windows, home insulation, storm damage roof repair, Free Roof Inspections and Estimates. As any NC homeowner knows, the summer months in Raleigh may become somewhat tumultuous occasionally, and anytime you’ve got a serious storm rolling through the region, among the greatest things you can do to help your house is to call in a specialist NC roofing contractor and have them give you a comprehensive roofing inspection. Between collapsing branches, pounding hail, and twisting winds, you can find any number of variables that could end up causing harm to your house’s roof throughout the span of a storm, and even when the harm is somewhat minor, using an expert come out and provide you an exhaustive inspection so that you may have peace of mind is a remarkably valuable resource. To help highlight only some of the more prominent reasons you are going to want to make the investment at an expert roofing review for your house in the aftermath of a storm, our group of professionals have taken the opportunity to put together this brief list we hope you’ll take a few brief minutes to navigate through. Although it’s always useful to perform an initial evaluation of any harm that may have caused the latest storm, it will be impossible get the entire reach of your roof state from the floor. While breaking the ladder out and getting up there is certainly a choice, choosing a team of professionals to do this for you won’t only help to make sure your security, but it is going to also supply you with an experienced pair of eyes around the occupation that understand what to be on the watch for, and what’s going to have to get accomplished with any problems which are uncovered. Purchasing a professional roof review in the aftermath of a passing storm can really be a terrific way to save a little bit of cash in the long term. Even though a roof review will not magically create any harm your roof has continued evaporate, it is going to provide you a very clear sign of where compensation might lie, such as damages which may be present which are not about the storm. By grabbing one or more one of these problems early on, you stand to save a lot of money in repair costs, because most issues are a lot easier to fix before they’ve had the opportunity to spread in your property. If your roofing finds enough damage in the aftermath of a passing storm it warrants filing a claim with your insurance provider, you’re likely to require an expert review to find a extent of the harm and also an indicator of how much it will cost to repair. By hiring your personal, who will be unbiased and offer you a reasonable quote for your repair expenses, instead of one sent out from the insurer who will probably be searching for their best interests, rather than yours. whole lot of money and hassle down the road. There are much too many homeowners around who dismiss the significance of functioning gutters on their houses. Regardless of what you might believe, your gutters play a remarkably significant function in the general security of your house, and particularly your own roof. Your gutters operate to assist channel any sort of down rainwater and securely from your roof and away from the base of your house, but when your gutters are clogged and cannot execute this function as though they’re supposed to, you can end up with a significant problem in your hands. If water can pool onto your rooftop, it may begin to float under your shingles and disperse throughout your loft and the different regions of your house, resulting in the very tough job of drying out everything and fixing the harm. Additionally, the extra weight from all that water may cause your gutters to rip away from your house completely, leaving you with a lot of harm to wash up that you likely did not desire. Take some time to get up there and make sure your gutters are washed out to help remove the chance of any harm occurring when the rains begin to return. Clear Away Overhanging Debris Among the most crucial things you can do to safeguard your house’s roof is to be certain that, prior to any violent storms roll through the region, you have a stroll around your house and search for any sort of overhanging debris which may pose a danger to your roof. As you may prefer the color given by that old tree, even if some of these branches were to split off during a storm and come back on your roof, then you might end up facing a tragedy. Take some time to clean off and overhanging branches and so on and be on the watch for any dead limbs or trees which may be a bit close to your property. Taking time to clean them away may go a very long way in helping protect your house in case of a storm. If You’re Searching for a roofing contractor Business in the Raleigh area, Contact Us ! Hail damage roofing inspection 27513, Hail damage roofing inspection 27545, Hail damage roofing inspection 27560, Hail damage roofing inspection 27601, Hail damage roofing inspection 27602, Hail damage roofing inspection 27603, Hail damage roofing inspection 27604, Hail damage roofing inspection 27605, Hail damage roofing inspection 27606, Hail damage roofing inspection 27607, Hail damage roofing inspection 27609, Hail damage roofing inspection 27610, Hail damage roofing inspection 27611, Hail damage roofing inspection 27612, Hail damage roofing inspection 27613, Hail damage roofing inspection 27614, Hail damage roofing inspection, Hail damage roofing inspection 27616, Hail damage roofing inspection 27617, Hail damage roofing inspection 27619, Hail damage roofing inspection 27656, Hail damage roofing inspection 27658, Hail damage roofing inspection 27661, Hail damage roofing inspection 27668, Hail damage roofing inspection 27675, Hail damage roofing inspection 27676, Hail damage roofing inspection 27690, Hail damage roofing inspection 27695, Hail damage roofing inspection contractors 27697, Hail damage roofing inspection 27698, Hail damage roofing inspection 27597. Call for a FREE Estimate and we’ll come to you in the comfort of your NC home.